I love the freedom of being my own boss, working my own hours, being around people that fit our business culture, setting goals and working towards them. I sometimes worry about how long I can stay in business, as times get tough and costs, competition, regulation, taxes increase. Not to mention how quickly the market changes. My aim is to work more on the business, rather than just in it. I really want to set money aside to for the future. To make this all worth it. It’ll all ‘work out’ attitude. Embarking on the property investment journey can be difficult if you don’t have an accurate map, a skilled navigator, and a trustworthy support crew behind you. That’s where we fit in. 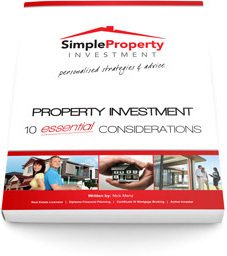 We provide an easy 7 Step process to make property investment simple. Work with a SPI Advisor to create a personalised strategy for your property portfolio based on: your current position, goals, preferences, and risk profile. SPI coordinates with your finance specialist or can recommend one if needed. It is important to set up the correct finance structure to complement your strategy. Your SPI Advisor will work with you to identify the right kind of properties that suit your strategy and profile. A shortlist will be created of suitable options for you to review from an online portal. After selecting your property, your Advisor will prepare a detailed cash-flow analysis. It will detail all the financial aspects of the investment and how it relates to you and your budget. When the property has been approved, Simple Property Investment and ASPIRE Advisor Network will manage the transaction process from start to finish. We’ll make your experience as simple and smooth as possible. At settlement, you can take advantage of SPI’s extensive network: property managers, quantity surveyors, and independent building inspectors. Review the process and outcome. Make plans for the next step of your strategy if required. The following is a list of most frequently asked questions by Business Owners. To view the entire list of frequently asked questions, please visit the FAQs page. We are time poor. But want to learn more about property investment. Can you help? Your time is precious. And perhaps you’d rather be relaxing with a glass of wine in hand in the company of your loved ones than investigating the countless investment options out there. Let alone struggling on your own through the often arduous process of making a purchase happen. And filtering out the right people to help you. It’s a jungle out there…in this currently unregulated property investment industry. To guide you through the investment jungle with professionally insured property investment advice. To recommend trusted professionals who are at the top of their fields to work with you if needed. To take you through our simple 7 step process to easily acquire an appropriate property that fits your individual requirements. We’re here to answer your questions. We’re here to explain industry jargon in a way that makes sense. To follow up on those documents, or give a push to that person you need to hurry along. And we’re here to give you a full and quality service without charging you ridiculous fees along the way. To make sure you get your property at a competitive market value. We are sick of paying so much tax. How can property investment help us reduce tax? There are many ways to reduce tax through property with the help of the taxman. Many factors are involved and we always recommend speaking to your accountant. Would you like one of our property advisors to call you? Just submit your details and we will contact you within 1 business day. Alternatively, call 1300 82 83 08 between 9:00am and 8:00pm, Monday to Saturday. "Personalisation of service, having investors best interests looked after, ease of communication, great range of additional services to make property acquisition easy." "The knowledge of the staff was great and nothing was a problem for them." "I liked that it was personalised, and tailored to my needs." "Personalised attention, friendly and trustworthy." We are really happy with how the property turned out. Thanks for helping us with this investment along the way, you guys and ASPIRE have been really professional and helpful in getting everything sorted for me. We look forward to working with you guys again in the future if the opportunity arises.